Welcome (Again, For The Very First Time) to YNAB! Ever wish you could go back and do something all over again? Had a really good idea and hoped it wasn’t too late to make it a reality? Yeah, it happened to us too. In the past ten years, we’ve learned a lot about what helps people budget successfully and eliminate their financial stress. Along the way, we’ve stuck to a set of principles – our Method – and built some darn good software. But we didn’t want to build the next version of “darn good”. We wanted to imagine what YNAB could be if we designed it right now, from the ground up. And so we did. And then we built it. This version of YNAB isn’t YNAB 5. It’s not “next” at all. It’s a re-imagined and re-built YNAB. Familiar, yes, and built on those same core principles. But different in ways that have helped us re-commit to the method and our goal of eliminating your stress around money. That’s one user’s reflection, but we’ve found that it captures just what so many of us have felt using the new YNAB. We hope it means the same for you! We’ve got lots more to tell you. We’ll start with some quick Q & A, then dive in deep on the method, exciting new features, and … and … well, just read on! We’ve got a Quick Start Guide, sure, but you’ve already started with YNAB. You need quick answers to your questions about transitioning. Here they are. You can try the new YNAB right here. But to do that, you’ll need to create a brand new account. The email you used when you bought YNAB 4 or your Dropbox credentials won’t work. It’s a new YNAB! We love our mobile apps and they are full of new functionality and better than ever! Next, grab the new iPhone/iPad app or Android app. The new YNAB is $83.99 per year. If you are a YNAB 4 user (that’s how you got to this page, right? ), we’ll give you a lifetime ten percent discount, making it $75.59/year. Just create your account using the email address you used to purchase YNAB 4, and you’ll be all set! But I love my old budget! The heart of YNAB has always been the Method. It’s what makes your budgeting successful, and it drives everything we do (spoiler alert, the software changes described below are all about making the method easier to implement). The foundation of the method is our Four Rules. Over the years, though, we’ve found ourselves talking about more than just those rules. And you’ve been asking about more than just those rules. Like, how to set goals or which jobs should get dollars first. 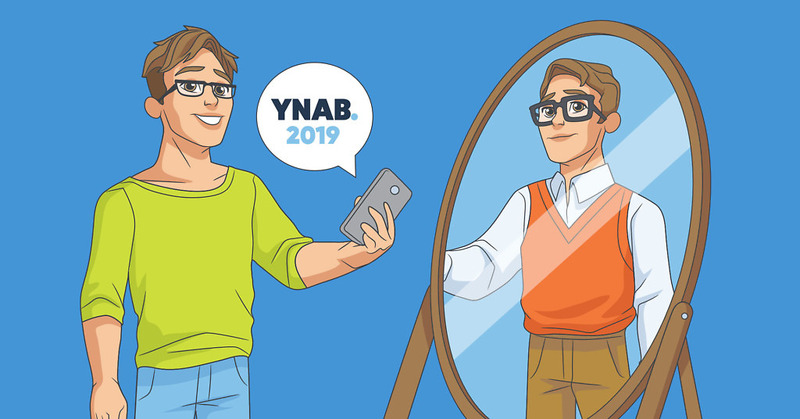 So with the new YNAB, we’re introducing some new resources and new thinking that take the YNAB Method to the next level. Rule One is rock solid. Give Every Dollar a Job. Just like it’s always been. (Well, really Rule Four used to be Rule One, but that’s ancient history). Rule One reminds us to prioritize, to examine each dollar we have in hand and give it a job. A lot people weren’t sure, though, of the best way to go about that. In many respects, it’s up to you. They’re your dollars, right? They’re your priorities, right? That’s always been true and always will be. But we realized we do have something to say about an effective sequence for prioritizing. The sequence involves all four rules, but it’s all in the spirit of Rule One – making sure every dollar has a job, whether that’s right now, for a True Expense, for rolling with a punch, or pushing it to next month. You can read about it in detail in the Prioritize (see what we did there?) Guide. The first is that budgeting is a process. It’s an activity. We’ve always said this, but now can offer one model of what that process might look like. The second is that giving every dollar a job means using a sequence for prioritizing (ours or a custom one!) when you sit down to budget to assign dollars until To be Budgeted is zero. Then you know you’re done. What we don’t mean is that this must be done less than one hour after receiving money, or that you have to finish it before you get up off the couch, or else you’ve failed. If you want to wait for a Friday night budget date or for a couple of paychecks to join up, go for it. Whenever you do sit down to budget, budget to zero. Choosing names for babies (or cats or goldfish) is always hard. But you want to get it just right. Rules One and Three? We already had them just right. Rules Two and Four get upgrades, each for different reasons but with the idea of better aligning the name of the rule with what it does for you and your budget. Let’s talk about Rule Two, FKA “Save for a Rainy Day.” It’s a good name, but really, not all the large, infrequent expenses that you save up for are rainy days. Car repairs? Maybe a rainy day. But that vacation to the South Pacific? Not a rainy day. (Really, it isn’t going to rain on that vacation.) On top of that, the word “save” confused a lot of people who had certain, specific associations with savings accounts. So we’re introducing Rule Two: Embrace your True Expenses. As a way to explain what rainy days were, we’ve often explained the concept of your True Expenses being more than just your regular monthly spending. So, ah, rather than doing that two-step, we made it a one step. And yes, “embrace” is very purposeful here. They’re that important. Rule Three. Really a Rule. The name of Rule Three hasn’t changed. But the rule itself is getting more emphasis on it when it comes to honesty in your budget. When you overspend a category with cash spending (meaning non-credit spending, not just literal cash), you can’t trust your category balances. That’s because the amount you overspent has left your budget entirely. Dollars that appear to be sitting in one of your categories are actually gone. That’s why it is so important to use Rule Three to cover overspending right away, and why, if you don’t, the overspent amount is deducted from the following month. 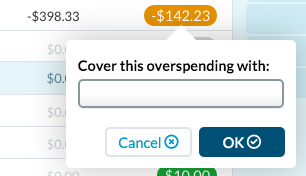 In YNAB 4, though, you could override this setting. You could let that overspending “ride” in that one category. This meant we weren’t giving you honest information about what you had available in your categories. And you weren’t really giving every dollar a job, either – you were giving jobs to dollars you didn’t have! For people close to the financial edge, this is downright risky. If you’re not close to the edge and have larger reserves, go ahead and use them to cover that overspending. Rule Four: Am I Buffered? Rule Four gets a name change and a metric. Make no mistake, though, that Rule Four’s purpose has always been to increase financial security, stability, and flexibility. And that’s not changing. If you have achieved Rule Four, you know how good it feels. The trouble, though, was that lots of people didn’t know if they had achieved Rule Four. In previous versions of YNAB, Rule Four has been described as living on last month’s income. Except when it was called Stop Living Paycheck-to-Paycheck. The money used to do this was referred to as The Buffer. If you’re keeping track, that’s three labels right there. About two too many. And then there was the issue of whether you were “buffered” (why not make it an adjective too!) if you were paid on the last day of the previous month. No? What about three days before? Five? if you were paid irregularly? Quarterly? This list went on. Oh, and then there was how to get there? Have a lump sum fall from the sky? Use a Buffer category? Let it roll in your Available to Budget? Should I budget half of this paycheck to next month or what?!?! And finally, with this binary Buffer, you had it or you didn’t. Not much feedback available along the way. And once you had it, you couldn’t really make it any better. As simple a concept as it seemed when we first hatched it … it really wasn’t simple. With the new YNAB, we’re introducing Age of Money. The longer the delay between receiving and spending your money, the older your money. This has always been where the security of Rule 4 comes from. YNAB now measures how old your money is on average when you spend it. The bottom line? Older money means a more secure, stable, and flexible financial life. Older money means less stress. You’ll naturally age your money by implementing YNAB’s first three rules. Yes, your Rule Two funds provide that same security and stability that “The Buffer” always did. It’s just that we had drawn a kind of artificial line between them before. You can also age your money by explicitly allocating some money toward next month’s expenses. Hey, you can drop whole paychecks right into next month’s categories, just like you always did in YNAB 4. Enjoy it, it’s a milestone. Whatever your workflow, the goal is to have money that is at least 30 days old. You’ll be able to watch your incremental, day-by-day progress. Our guess is many YNABers will end up with pretty ancient money. A budget is all about reducing stress. Then achieving your wildest dreams, sure, but first it is all about reducing your financial stress. And what causes people financial stress? It isn’t necessarily about not having enough money. It’s about not knowing what to do with that money, or always feeling like you’re on the edge. It’s about having debt payments that weigh you down, about never reaching goals, having a ridiculously complex financial life, or not knowing how to budget together as a couple. So those six things there that cause people stress? There’s now a Help Guide (complete with videos!) for each one. Prioritize, which is really what you do when you combine the power of the first three rules. The key to reaching goals? The software feature helps, but it turns out it is all about Thinking Long and Acting Now. Dealing with your Debt isn’t just about willpower. It’s about not going backwards and then having a specific plan. Budgeting for two? The key ideas are the same, but it’s a little different in some ways. Join Forces and find out what your budget can do for your shared stress – and your shared dreams. And, of course, your stress will completely dissolve when you Age Your Money. Our Guide will walk you through the concept, handy metaphors and all. Everyone loves new stuff. New toys. The new car smell. But we weren’t shooting just for new here. These features make what has always been great about YNAB – things like budgeting on the go, focusing on budgeting decisions, and breaking the paycheck-to-paycheck cycle – even better. Moving YNAB to a web-based app isn’t just a change in location for your budget. It opens up new possibilities for accessing your budget, and makes it entirely seamless. Chromebook? Sure. Linux? You betcha. Just log in and get budgeting. We could have put this under a section about things we’ve improved or downright fixed, because our web-based platform also means no more Dropbox. No more needing to clear out Dropbox when it’s full. No more glitches where your mobile device seems to lose track of Dropbox. (It’s OK, if you’re cheering out loud — we are too!) We want your multiple devices to just work. Laptop, desktop, Android, iOS, you name it. Just log in and get budgeting. For you technical-minded folks, we’re going to sync your devices in two ways. If you make a change in the web app, we’ll push that up to the server and your other devices immediately. If you make a change on your mobile device, that may take up to 60 seconds to filter down to the web app. But it’s worth that potential wait. Because sync is now perfectly invisible. Perfectly accessible. Perfectly simple. Your YNAB. Online. It is practically like budgeting superpowers! You can now import transactions directly from your bank. (Yes! Really!) This improves upon the prior import feature, which required you to first visit your bank’s website and download a set of transactions. YNAB now does that for you in the background. 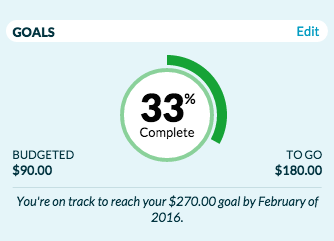 Set a target for what you want available in a category, add a target date, or set a simple contribution goal. Paying off credit cards? Set a debt pay-down goal. Need a vacation? A new car? You get the idea. In YNAB 4, your category balance number was either black-and-white or, if you overspent, red. In the new YNAB, your category Available (yep, there’s a label change there) may be one of four colors. It will be gray if you have nothing going on at all, yellow if you’re underfunded (when you’re short of a goal or an upcoming transaction in the current month) or credit overspent, or green if everything is a-ok. There’s still red, of course, nice and vibrant, for cash overspending. What difference does this make? It’s better feedback. It’s decision-making information that you almost don’t even have to think about it. And when you act on it, your budget shines. See red? Cover it now or you can’t trust all your Available numbers. See yellow? You need more money there. Use Rule Three, and if you don’t have the money, it may be a signal to re-evaluate your goals. Trust us, you’ll grow addicted to the idea of making the month green. Easy access to budget information is key to making good decisions. The Inspector provides this access – beautifully. 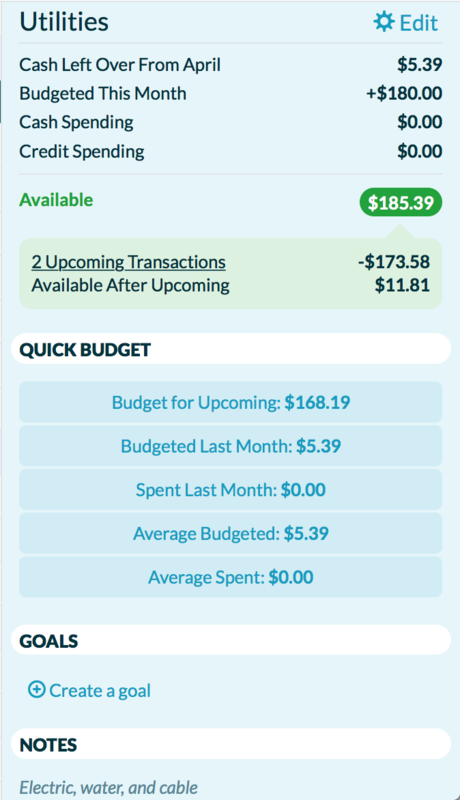 Right alongside your budget, you’ll see summary information about your budgeting activity and options for quick budgeting. Select a category and the Inspector really shines. If you have upcoming scheduled transactions in that category, you’ll see whether you’ve budgeted enough to cover them, and what will be leftover once you pay them. If you’ve selected a credit card payment category, you’ll see information about your last and, more importantly, next payment. If you’ve set a goal, this is where you’ll track your progress. You’ll get breakdowns on how long it will take to reach your goal, or how much to budget if you’ve already set a target date for that goal. All of this without having to move your eyes anywhere else or do any math. That’s serious focus, people. There’s a reason so many YNAB users claim Rule Three as their favorite: because life doesn’t always go as planned and you need a budget that can keep up! Making changes keeps you on track. It means your budget reflects reality. We’ve made it even easier to roll with the punches. To move money from one category to another, simply click on the Available amount for that category. To cover overspending (it happens to the best of us! ), simply click on the overspent amount in your budget. No more complicated math on the side. So simple – you’ll love it. Not much explanation required here. This has always been one of our most-requested features, and it’s easy to see why – enjoy! Something doesn’t have to be brand-new to be better. Sometimes, it’s more about improving on a starting point. And, truth be told, we’re fairly obsessed about that. So here’s a few features that have gotten some serious polish. The Scheduler in YNAB 4 always allowed you to stay organized and on-time with bills and future transactions. But now it’s even better, (Are you picking up on a trend here?) because we’ve integrated those features right into your register. When you enter any transaction, you set it to repeat, right there as a part of the normal entry process. Easy. Quick Budgeting remains true to its old form while becoming easier to use and providing more powerful budgeting guidance. You’ll find Quick Budget options in the Inspector, with options to budget based on previous budgeting activity or previous spending activity. The real magic happens when you combine Quick Budgeting with Goals and Scheduled Transactions. If any of your categories are underfunded based on a goal you’ve set or a scheduled transaction that is happening in the current month, you’ll see a Quick Budget option called “Underfunded”. Give that a click and the appropriate amounts will be budgeted to those categories. You’re still making the decisions, because you set the goals and scheduled the transactions. We’re just making it easier. Way easier. This one doesn’t need a lot of explanation. It’s just so much better. 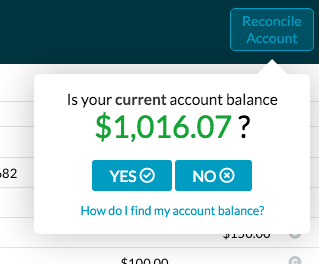 We’ll first ask you if the balance in your bank records as of today matches what YNAB says it should be. Most of the time, because you’re entering on the go with your mobile device and double-checking with Direct Import, it will. You’ll be done as soon as you start. If your balances don’t match, you’ll stay right there in your register clearing and adding transactions as needed. YNAB will keep you up-to-date in a blue status bar right at the top. Over the years, we had approximately 17,411 requests to allow budgeting money to a future month beyond the next month. But in YNAB 4, you could choose Income: Available This Month or Income: Available Next Month. That’s it. No matter how much money you had. If you went rogue and started just budgeting two months out, your Available to Budget in the current month wouldn’t change. Not good. Keep in mind that once you budget into the future, the last month where you have activity is where your most up-to-date numbers are. If you budget $1000 in the next month, but then keep budgeting in this month, those dollars will come first out of your “Budgeted in Future” amount, not from your current month’s To be Budgeted. If you budget more in the current month than you had budgeted in the future all together, then you’ll see the current month’s To be Budgeted go red. If we could go back in time, long before YNAB 4, and build our credit card handling from scratch, the changes in the new YNAB are exactly what we would design. But time travel isn’t necessary, because our ideal design is today’s reality. First, forget what you know about credit cards in YNAB 4. Seriously. Really try and forget it! We’ve changed it because that system didn’t reflect the real world. Everything we have done is about building a system that reflects what actually happens when you use a credit card and use it inside a budget, whether you are an old hand or just deciding to tackle your credit cards and debt for the very first time. It all comes down to four big ideas. But first, one key step in your transition, then a story. This is jumping ahead, but it’s important: Credit Card accounts receive special handling in the new YNAB. When you use a credit card to purchase something you budgeted for, those budgeted dollars move to a credit card payments category. You’ll always be ready for your payment (and know how much you can pay!). When you add your credit card account, make sure you choose Credit Card as the type. A category for payments will be created automatically. Now, the key. This is the place where a lot of transitioning YNABers are getting caught: Once this payment category is created, budget for the starting balance on your card. If you can’t budget for the entire balance, set a goal for what you cannot pay off right away. Then, when you make your first payment, make sure you have that same amount Available in your Credit Card Payments category. Imagine going to the local general store, back before credit cards ever existed. We’re talking a cash-based world here. They have everything, and you know the people behind the counter. You find and plan to buy a $30 shirt. You feel good, because you are a budgeter, and you had set aside $30 for clothing. You’ve even got that $30 cash in your pocket … oh, oops … you left your cash at home. But that’s okay, because you know these people well, and they tell you to just take the shirt. You’re good for it, they say, just bring us the $30 later. So you go home. You have three things: You have the shirt. You still have the $30. And you also now have $30 in debt. So you take the $30 you had set aside for clothing and you move it to your pocket. You’ll be at the store again tomorrow, and you’ll be wearing the same pants (don’t ask). This is how credit cards now work in YNAB. In YNAB 4, you pretended that the $30 was gone already. But it wasn’t. It was all good-intentioned, sure. Thinking of the money as gone from your budget was the right idea. Except it’s gone from your category, not your budget. Now it’s got a new job, to pay off the $30 in debt you have. It’s such a fancy word, in fact, you may forget that you’re carrying debt from the moment you make a purchase with a credit card. Maybe it’s purposeful. After all, would you use a credit card as freely if it were called a “Walk-around-racking-up-debt-card”? Even if you pay your card in full and have cash on hand to back up your credit purchase, though, you have incurred debt. Immediately. You borrowed money. So how does a budget help you? If you’ve budgeted for that purchase, you already have a plan to pay it off. We’ve always wanted to reflect the idea that, when you use a credit card within your budget, that purchase “used” the money you had responsibly budgeted. So, we said, when you bought a $30 shirt with budgeted money, that $30 was gone. Except that it wasn’t. Up until you paid the credit card bill, the money was still in your checking account. We fixed it. Now when you buy that $30 shirt, the money in your clothing category will move to a credit card payments category. Just like YNAB 4, you’ll have $30 less in your clothing category – ‘cause it moved. You now have money budgeted to make your credit card payment. That’s reality. Here’s the real win: Your payment? It’s the amount available in your Credit Card Payments category. That’s it. Money is added to that category either through budgeted spending or because you budget it directly there to pay down a credit card balance you already had. You can see all about it, including what part of the available amount came from last month, from card activity this month, and from budgeting directly to the category this month. You’ll also see a graph depicting the effect of paying your full available amount. If you’re a paid-in-full user with no overspending in your budget, this will also match the balance on your card. Nice, huh? When you overspend from a cash-based account like a checking account, money has left your budget and your accounts. In essence, you’ve taken money from one of your other categories and spent it. When you overspend on a credit card, the money hasn’t actually left your checking account yet. Instead, with overspending on a card, the consequence is that there’s no money to move to the payment. You have debt that you don’t have a plan to pay off (yet). To go back to the store-in-a-cash-based-world for a minute: It’s like having $30 at home for clothing, and then walking out with a $40 shirt. You’ve got a plan to pay those nice people back for $30 … but you’ve got to come up with the other $10. Happily, the way to fix this is to do exactly what your budget and the YNAB method would normally have you do. Roll with the Punches. Cover the overspending. Reprioritize and move some money. If you don’t use Rule 3 and cover the overspending? After the month rolls over, that overspending is represented in the balance of your account (in the balance of what you owe those awesome people at the general store). Budget money to your credit card payments category to pay it off. Credit cards are debt instruments. We’ve hammered that home here. But they do receive inflows. Some of those are payments and are straightforward. But some are cash back. Some are overpayments. And some even leave you with a positive balance. So here’s the deal: positive balances on credit cards are treated like cash. You can budget them, just like money in your checking account. Positive inflows to cards just reduce your debt. So if you get one, you may notice that you suddenly have more money in your payment category than you actually need to pay. But that’s okay, you can move that money just like you do any other money in your budget. While we can’t give you a date to circle in your calendar (we’ve gotten really good at dialing in features, but nobody is really good at dialing in exact dates), we’re excited about the continuous development that will go on after launch. While that could take many forms, these items are pretty high on our list. Oh, and if the one you’re looking for isn’t here? That doesn’t mean it won’t happen – but these are the ones we have prioritized. Coming from YNAB 4? Or YNAB 3, even? You’ll soon now be able to bring your budget with you. Check out the detailed instructions below. We don’t want you to pull out a separate calculator when you’re working in a budget cell. Inline calculations are on the way! So inline calculations are here! Need to find something in your budget? We understand. You’ll be able to do it. In the meantime, filtering and sorting will get you a good part of the way there. That’s why we released it. Your budget is forward looking, with a strong emphasis on right now. But hey, the past can hold some important information for you, too. Historical spending trends are super honest and can help you budget. It’s all good. Reports will arrive in the new YNAB. have arrived in the new YNAB – and they’re better than ever. Is your bank outside of the US or Canada, or do you prefer to import transactions manually? The ability to import a file from your bank is coming. currently being rolled out (slowly!) to customers as of July 1! really slick, you should try it! (What about exporting, you ask? Yes, that too. ) Exporting has arrived! One of our first major initiatives is a YNAB desktop app. How would you like your accounts listed? Alphabetically? According to how often you use them? By how happy you are to have each one? Hey, it’s up to you, and you’ll be able to change you can now change that sort order! You love them. We love them. Your mouse and trackpad are jealous of them. Get ready to be lonely, trackpad, they’re coming. they’re here! We never felt like we did Payee Settings well, and the automation in the new YNAB is a first significant step to improving it. More robust payee management is on the way, but you won’t find those controls you had in YNAB 4. What about the [insert your favorite feature here]? That list may not include everything you’re looking for. Some features that were in YNAB 4 are not in the new YNAB. Let’s talk about a couple of those. It’s nothing against the far-left and far-right sides of the account register, but these two customizations aren’t in the new YNAB register. The memo field works great for check numbers, and the running balance? With direct import, you’re much less likely to need it. In a desktop app? Can do. In a web app? Particularly tricky to make ’em sticky. You can bring your YNAB 4 Classic budget into the new YNAB with our Fresh Start migration. This brings over your personalized categories, payees, scheduled transactions, and account names and types, but not your transaction history. It will give you a familiar starting place if you’re keen to get started now. Create your account for the new YNAB if you haven’t already. Be sure your YNAB 4 is updated to a new version (at least 4.3.817). To be sure, just click “Check for Updates” in the YNAB 4 (Mac) or File (Windows) menu. Open YNAB 4 and select “Migrate to the New YNAB” from the File menu in YNAB 4. Start budgeting, with all the joy, bells, and whistles (and goals!) that come along with it. If you’re going to connect with Direct Import, your starting balance will be brought in for you. If not, enter today’s balance as a part of the starting balance transaction for each account. If you have credit card accounts, be sure to check the Quick Start Guide for credit cards. In particular, be sure to budget for your starting balance! Moving over from YNAB 3? You’ve got to make a stop in YNAB 4 first. Download the newest version of YNAB 4. Open your YNAB 3 budget in YNAB 4. Follow steps 3-5 above, including the joy part in step 5! Moving from a Mac App Store version of YNAB 4? Write to us at [email protected] with proof of your App Store purchase, and we’ll set you up with a YNAB 4 key. Then you can follow the directions above! We’re committed to your new budget giving you 100% accurate feedback about right now. Want a look ahead? Check out how the Inspector uses those upcoming transactions to preview what you’ll have Available in categories after that activity.